Bottled water is a sustainable and healthy substitute to carbonated soft drinks which consists of sugar, calories and artificial flavors and colors. Bottled water is better than tap water, and provides necessary taste and health benefits. The health awareness revolution in Australia, there is a huge shift of consumers from soft drinks and juices towards bottled water. In 2017, 28.3% of population consumed bottled water.. Australia’s average per capita consumption of bottled water was 30.8 liters in 2017. This marked a growth of 5.1% in 2017 as compared to previous year. The Northern Territory of Australia experiences the wet seasons and has huge availability of water source through Acacia Hills and Dolomite Mineral Spring Aquifer, marking it the major region for the establishment of bottled water plant. The popularity of bottled water is majorly among the people in age group of 25-34 yrs. 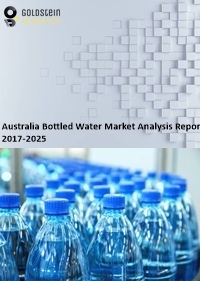 Goldstein Research analyst forecast that the Australia bottled water market size is set to reach USD 1,361 million by 2025, growing at a CAGR of 3.90% over the forecast period. Rising health concerns among the consumers, adequate source of water, packaging industry and further research and development is expected to push the growth of Australia bottled water market. The report covers the present ground scenario and the future growth prospects of the bottled water market for 2017-2025 along with the unit sales and revenue of the bottled water. We calculated the market size and revenue share on the basis of revenue generated from major players across the globe. We have forecast the market on the basis of number of bottled water manufacturers, suppliers and distributors, average selling price, volume consumption. On the basis of product type, prepared water accounted for the highest market share of 60% in 2017 and will continue to dominate the market during the forecast period, owing to the changing preferences as per the health concerns. However, mineral water is expected to be the fastest growing segment over the forecast period. Bottled water market outlook 2017-2025, has been prepared based on an in-depth market analysis from industry experts. The report covers the competitive landscape and current position of major players in the bottled water market. The report also includes porter’s five force model, SWOT analysis, company profiling, business strategies of market players and their business models. Australia bottled water market report also recognizes value chain analysis to understand the cost differentiation to provide competitive advantage to the existing and new entry players. The growth of premium natural mineral water is one of the major trends in the Australia bottled water market. Currently nearly 80% of the sales for natural mineral water come from institutions such as hotels, restaurants, fitness clubs and air ports. The majority of the sales is either in metro cites or tourist destinations across the country. Key consumers include mostly the tourists and high profile customers who demand only premium products. Growing health consciousness among the population coupled with strong economic growth is driving the Australia bottled water market. As consumers continue to worry about water safety and hygiene, the growing economy and population would continue to have a positive impact on packaged drinking water sales in the coming years. Presence of large number of unorganized players manufacturing bottled water, pose a challenge for Australia bottled water market. Unorganized players often provide poor quality packaged drinking waters at much lower cost and are eating organized players revenue share. Based on geography, Northern territory accounted for highest market share of 63.4% in 2017, as the availability of water sources and power grid in this region is attracting the establishment of bottled water plants. New South Wales (NSW) consists of developed cities where consumer’s annual household income on average is above USD 39,000 thus they are the major prospecting consumers of bottled waters. Australia bottled water market report comprises of the following companies as the key players in the bottled water market: Mount Franklin, Coca-Cola, PepsiCo, Coles Natural Spring Water, Pump Pure Water, Cool, Ridge, Frantelle, Peats Ridge, Aqua Pura Fruit Splash, Fiji Water, Evian. What is the revenue of bottled water market in 2016-17 and what would be the expected demand over the forecasted period?